The usual year-end cruise summary lists the newest ships and their latest features. But we bring you a slightly quirkier recap for the year 2012. Two of the most interesting results this year stem from the loss of the Costa Concordia in January. That tragedy has been well covered elsewhere, but the two results are: a German chief executive now heads up Costa Crociere, and CLIA has gone global. Other news for 2012 sees a new contender for the Northwest Passage, new concepts from Norwegian Cruise Line with the Waterfront on its latest ships and the end of Classic International Cruises. Holland America Line has abandoned Bermuda in favour of Canada, Seabourn goes to Antarctica and the mega-ships have arrived in Australia, while the Chinese cruise market conrinues to grow. We have also seen the beginning of a move back towards human scale cruise ships with Viking Ocean Cruises’ plans for up to six 48,000-ton cruise ships that will accommodate fewer than 1,000 passengers. Finally, in a surprise annoucement, STX France has nabbed the order for a third Oasis class ship for Royal Caribbean, with an option for a fourth. Happy New Year to All! In May 1948, the former Canadian cruise ship New Northland, a vessel that had cruised from Montreal in the summer time and from Miami by winter before the war, was purchased by the Flota Mercante Dominicana, or the Dominican Line, which placed her into service between New York, Puerto Plata and Ciudad Trujillo, as Santo Domingo was known under the rule of Dominican dictator President Trujillo. She was renamed Nuevo Dominicano and crewed by the Dominican Navy, and for a year and a half ran from New York. But not attracting enough passengers to fill her 177 berths, she was soon replaced by cargo ships. This is where Frank Leslie Fraser comes onto the scene. Fraser, whose family had started a banana shipping business from Jamaica in the 1930s, was the general administrator of the Flota Mercante Dominicana, president of Fraser Fruit & Shipping of Cuba, president of the Dominican Fruit & Steamship Co and managing director of the Maple Leaf Steamship Co of Montreal, through which he had purchased a number of coasters in Canada when his own banana boats had been requisitioned during the war. These coasters he had used to serve the Dominican Republic. But most importantly, Fraser was president of the Eastern Shipping Corporation, which would now charter the Nuevo Dominicano to cruise out of Miami. While visiting Kingston in his native Jamaica, Fraser told the “Gleaner” that the Nuevo Dominicano would make fortnightly trips to Jamaica, with stops at Kingston and Montego Bay as well as Ciudad Trujillo on a 12-night cruise. By arrangement with the Bahamian Government, she would also call at Nassau on Thursdays, leave on Friday morning and be in Miami by Saturday morning. “An exciting life will be yours aboard the s.s. Nuevo Dominicano (formerly known as the s.s. New Northland) with luxury accommodations for 177 passengers, completely refitted from stem to stern to provide all cruise comforts, modern services and delicious cuisine. The new swimming pool was installed where her forward cargo hatch had been. The ship’s most famous passenger during this period was actor Clark Gable who with his wife travelled to Nassau for a golfing holiday in December 1950. Although the Eastern Shipping Corporation successfully inaugurated year-round cruises from Miami, at the end of three years it decided to end its charter on the Nuevo Dominicano. For three years, all had gone well for the Nuevo Dominicano, but with a capacity of only 177 passengers, there was not much room for profit. Fraser’s absence would only be temporary, however. To replace Eastern, the Dominicans formed the Dominican Republic Steamship Line in 1953. Unwisely, the naval personnel were withdrawn and a mixed crew took over the deck and engine departments. Standards began to drop. The ship no longer called at Jamaica, but ran 11-day winter cruises on alternate Mondays from Miami to Nassau, Ciudad Trujillo and Port-au-Prince, and 3-night Friday weekend cruises from Miami to Nassau. The 11-day cruises also offered a short one-way passage from Miami to Nassau. Every Monday and Friday from July through September she ran 3-day cruises from Miami to Nassau. This was the opposite of what had been introduced by the New Northland in 1935 as these were summer cruises and not winter ones. So9on, however, the new management not only failed in passenger service, but the ship also suffered continual breakdowns. That August, she had to be towed into Miami by the US Coast Guard, and again in September by a salvage tug. At this point, the US Coast Guard suspended her passenger certificate and required a general refit of the safety equipment. She left Miami on October 9, 1953, for a refit in the Dominican Republic and within twenty-four hours was reported aground off Nuevitas, Cuba. On October 17, she ran aground again, on Punta Guarico, near Baracoa. On November 26, she was refloated and anchored in semi-protected waters but she suddenly went down. This ship had been a true pioneer of cruising from Miami – as the New Northland she had operated the first weekly cruises from that port, in January 1927, the first all-inclusive cruises (as opposed to overnight steamship service) between Miami and the Bahamas, in 1935, and as the Nuevo Dominicano had become Miami’s first year-round cruise ship, in 1950. The loss of the Nuevo Dominicano produced an opportunity for Fraser. His Eastern Shipping Corporation decided to look for a ship to fill the gap left by her loss and in May 1954, he bought Eastern Steamship Lines’ Yarmouth for $500,000. On June 18, 1954, his new ship began a series of 9-day Miami, Jamaica and Haiti cruises that alternated with 4-day Miami, Nassau and Havana cruises. However, at the request of the Bahamian Government, which no longer had the services of the Nuevo Dominicano, he soon renamed his ship Queen of Nassau and put her into a two-year contract running between Miami and Nassau. Following the same schedule as the Nuevo Dominicano, the Queen of Nassau left Miami for Nassau every Monday and Friday at 6 pm. If Fraser had not been able to make money with the Nuevo Dominicano‘s 177 berths, he could certainly do so with the 500-passenger Queen of Nassau. At the end of 1954, Fraser reunited the two sister ships by acquiring the Evangeline after she completed her last season on the Boston to Yarmouth run. The Evangeline did longer cruises but she made it to Nassau every second weekend. Fraser continued to build his business. In 1959, he acquired the Bahama Star at auction for $512,000 and promptly began advertising her as the largest cruise ship sailing from Miami. Late in 1960, he bought the Ariadne. These two ships at first offered longer cruises, then moved to the 3- and 4-day cycle, out of Miami and Port Everglades respectively, serving both Nassau and Freeport. Three days after this announcement, Rafael Trujillo was assassinated in the Dominican Republic, bringing to an end a dictatorship that had lasted for thirty-one years.And by January 1962, Fraser had passed full control to William Lovett, a 71-year-old financier who was experienced in running banana boats himself, as founder of the Winn-Dixie supermarket chain.. Meanwhile, in 1963, the Yarmouth had been sold to another Miami company, Yarmouth Cruises Inc, and was soon joined by the Evangeline, which was renamed Yarmouth Castle to fit in with the Yarmouth Cruise Lines theme. These veterans were placed onto a new run that served Freeport as well as Nassau, on a schedule of four sailings a week. The Yarmouth Castle, of course, is best known now for the loss of eighty-seven lives in a fire off the Bahamas on the night of November 13, 1965. Eastern Steamship Lines had kept the larger Bahama Star and Ariadne, but in 1968 it acquired the even larger New Bahama Star, formerly the Peninsular & Occidental Steamship Co’s Miami. The New Bahama Star in turn became the largest cruise ship to sail from Miami, and its purchase by Eastern effectively meant the end of a competitor, a company that had introduced the first Miami to the Miami-Nassau route seventy years earlier, in 1898. Passenger numbers leaving Miami reached 188,000 in 1967 and 246,000 in 1968. In 1970, Lovett, now 79, sold out to Gotaas-Larsen Corporation of Norway, one-third owner of Royal Caribbean Cruise Lines, which had been formed in 1968. By then, the number of Miami passengers was 610,000 and growing. Royal Caribbean was introducing three new ships to the Miami market in 1970-71 and others had also come onto the scene. In 1972, Eastern’s new Norwegian owners introduced its largest ship, the 24,458-ton Emerald Seas, acquired from Chandris Lines, partly in exchange for the smaller Ariadne. Although Gotaas-Larsen was involved in both Royal Caribbean and Eastern, any conflict of interest was avoided by Royal Caribbean handling the longer-duration 7- and 14-night cruises while Eastern looked after the 3- and 4-day market, now under its fourth name as Eastern Cruise Lines. Miami passenger numbers exceeded the million mark in 1977. Ultimately, a merger of Eastern Cruise Lines, its West Coast affiliate Western Cruise Lines and Stardance Cruises led to another new firm, Admiral Cruises, in 1986. By then, Miami was hosting three million passengers a year. Admiral Cruises was taken over in early 1992 by Royal Caribbean, which decided to sell its older ships and to complete its “Future Seas” newbuilding project as the 48,563-ton Nordic Empress. This was the first ship to be designed and built specifically for the Florida-Nassau short cruise market since Henry Flagler’s Miami of 1898, the trade having been served traditionally by second-hand, seasonal or chartered tonnage. For further details on how to book a cruise please call The Cruise People Ltd in London on 020 7723 2450 or e-mail cruise@cruisepeople.co.uk. The world’s largest passenger-carrying ship, the UK-registered CMA CGM Marco Polo, was christened in Zeebrugge, Belgium, today. Larger than the cruise ship Oasis of the Seas, she is also the world’s largest container ship (16,020 TEU) and will carry up to ten passengers in the French Asia Line service between Southampton and the Far East, a round voyage of about 77 days. Her 175,343 gross tons give the CMA CGM Marco Polo a passenger space ratio of a whopping 17,500 tons per passenger – except of course that that space is devoted to the carriage of cargo. CMA CGM has commissioned two more sister ships of the same tonnage to be delivered next spring. Calls will be made at Southampton, which she visited for the first time last week to unload Christmas presents for the British public, Hamburg, Bremerhaven, Zeebrugge, Rotterdam, Le Havre and Malta before continuing through the Suez Canal to Khor Fakkan, Jebel Ali, Ningbo, Shanghai, Xiamen, Hong Kong, Chiwan, Yantian, Port Kelang and back then through Suez to Tanger Med and Southampton. Sample fare: €4,900, or about £4,150 per person double (€5,390, or about £4,565 single) Southampton to Hong Kong. Sailings leave Rotterdam six days after Southampton and Le Havre eight days after, with fares adjusted by €100 per day (€110 per day single). The full round voyage of 77 days is €7,700, or about £6,520 per person double (€8,470, or about £7,170 single). Passengers dine with the officers and complimentary wine is served with lunch and dinner. Passenger bookings for the CMA CGM Marco Polo have now opened so for further details please call Miri Lopusna at The Cruise People Ltd in London on 020 7723 2450 or e-mail cruise@cruisepeople.co.uk. The Cruise Lines International Association has announced today that it is going global and will in future have arms such as CLIA UK (the Passenger Shipping Association/Association of Cruise Experts), CLIA Europe (the European Cruise Council), CLIA Brazil (ABREMAR) and CLIA Australasia (the International Cruise Council Australasia), among others. Meanwhile, with Argentina having refused to take any action to ensure the freedom of the seas for cruise ships calling on both Argentina and the Falkland Islands, some cruise lines are beginning to announce the cancellation of calls in Argentina, while others are dropping the Falkland Islands. Finally, we see what progress (if any) is being made towards Australian consumer protection. You have been in the industry for a long time. How did you get interested in the cruise sector? I was born in the UK and emigrated to Canada as a young boy, something that started my interest in ships and shipping. Then when I went to university in Canada I spent my summers working on cruise ships, first on the Great Lakes and then between Vancouver and Alaska. Upon graduation, I went into international shipping, where I spent more than two decades, including two assignments in the UK, involved in world trade. It was on my last UK assignment that I saw an opportunity to sell cruises here, so in 1992 I moved back to London and established The Cruise People. Tell us a little bit more about The Cruise People? To start with I was going to buy the UK rights for a large American franchise cruise seller but instead I negotiated with the Canadian company of the same name to be able to use the name The Cruise People in the UK. I bought an existing retail travel agency, which gave me a London address, some furniture and some rudimentary computers. Within a year, I had closed down the general retail business and was doing 100% cruises and sea travel. Soon after opening we received an appointment to act as a wholesale (and retail) booking agent for a North American-based expedition company. That was followed by a request from a German company to put passengers on their container ships. In 1999, we took on the general passenger agency for the Polish Steamship Company, who had just built five passenger carrying cargo ships for service between Amsterdam and the US Great Lakes. And at the end of 2005, we dedicated one cruise consultant to selling nothing but the six most expensive cruise lines. Are you a traditional brick and mortar travel agency or do you only specialise in selling cruise? We are a brick and mortar agency in that we are a twenty-first century business working from eighteenth century premises, concentrating on cruises and sea travel. But more than that, we are an international business, dealing not only in sterling, but also in euros and US dollars. Almost half of our business comes from outside the UK. We opened our first website in 1994 and that helped us internationally. Since we started a blog, however, it has been attracting twice as many visits as our own website’s main page. Visitors to our blog in the first six months came from the US (47%), the UK (21%), Canada (15%) and the rest mainly from Australia, Germany and France. Visitors to the main page of our web site, on the other hand, are totally different. More than half, 52%, come from the UK, 29% from the US, and the rest mainly from Australia, Canada, Brazil and France. Are there any particular segments of the cruise market your company targets? Niche is key for us. We now target three markets: ultra-luxury cruising, small ship and expedition cruising and freighter travel. I have recently returned from visiting the University of Virginia, where we have started working with Semester at Sea, which as well as offering seagoing semesters for university students, offer shorter Enrichment Voyages for ordinary (or out of the ordinary) passengers. Their ship, the Explorer, which usually spends several nights in each port, will be sailing in Europe next year. In general, since we opened twenty years ago we have become much less mainstream and much more specialised, something that helps us when cruise lines cut commissions, as they are now. Our chosen product range generally pays well and, unlike the mass market, niche products are not afflicted by that peculiar British disease of rebating from commission to buy the business, something I regard as totally unprofessional. What do you see as the major challenges and threats facing your business? one year alone, 2001, we had five principals go out of business. This included American Classic Voyages, Renaissance Cruises and three small ship operators. More recently, we had Cruise West and Hebridean International, the ashes of which were picked up by All Leisure. Not only do we have to ensure that our clients are protected when suppliers fail but we also have to try to protect our own commissions. We are still waiting for the courts in Seattle to decide on several thousand dollars owed to us by Cruise West and we also lost money on Hebridean. So a warning to agents – always check out your principals. But what hurts even more these days is cruise lines restraining trade by prohibiting crossborder sales. Unlike others, we are not a local neighbourhood agent, nor do we operate a national call centre. Almost half our clients (and also our product by the way) come from outside the UK, so cruise lines prohibiting cross-border sales are an increasing problem. Are there any areas that you believe cruise lines could improve on to assist your company to sell more cruises? that clients pay by credit card when they are booking offshore. Otherwise, the market should be free. The other thing cruise lines should do is to maintain base commission at 10% but offer incentives that allow agents to make more. I remind you that we will no longer support lines that don’t pay adequately as we have other products to sell that give us a better margin. What is your favourite cruise destination and why? My favourite destination was Bermuda, but with the advent of larger ships the experience of cruising to that island is no longer what it was. Until about five years ago, purpose-built cruise ships operated in the New York-Bermuda trade, sailing right in to Front Street. But because of channel restrictions into Hamilton and the increasing size of cruise ships, they now go to a place called Dockyard, a sort of shopping mall located 45 minutes away from Hamilton by taxi. This is no longer a great cruise experience. In Europe, my favourite is Venice, but Venice too is suffering from an increase in ship size, and there are moves afoot to stop cruise ships sailing along the Grand Canal and past St Mark’s Square. If this happens, there is still Santorini, where ships anchor in the caldera and where the sunset is one of the most spectacular in the world. In your view what destination is emerging as the next big growth area for cruising? In a word, BRIC – or in four, Brazil, Russia, India and China. Not only are these great destinations but they are also rapidly emerging consumer markets. There is not a week goes by when we do not get multiple enquiries from Brazil, and the same can be said of the Far East. There is a lot of money in these places. We get relatively fewer enquiries from India and Russia, but Mumbai and the Indian Ocean islands and St Petersburg and the Baltic are destinations that attract a lot of interest. We have clients doing a great tour of the Indian Ocean in December with Oceania, starting in Dubai and sailing to India, the Indian Ocean islands and East Africa before finishing in Cape Town. China too is growing, not only as western lines bring in newer and larger ships but also as the Chinese themselves prepare to build their first cruise ships. Popular ports in the Caribbean and Mediterranean are being spoiled as cruise ship crowds keep getting bigger, and there is in general more commission to be made by selling cruises to the BRICs. This week, The Cruise Examiner, having just disembarked from the Crystal Serenity in Barcelona yesterday, brings us Part 2 of his report on the new all-inclusive Crystal Cruises. Elsewhere, Viking attracted all the attention last week with an agreement from Viking Ocean Cruises to build two more 944-berth ocean cruise ships at Fincantieri, with an option for a further two. This could bring its new fleet of ocean cruisers to six ships by 2020. Sister line Viking River Cruises meanwhile surprised all with an order for a further ten new Viking Longship class river cruisers. These will be built by river cruise shipbuilder Neptun Werft, a 162-year-old Rostock shipyard that has built over 1,500 ships in its time, including a few U-Boats. 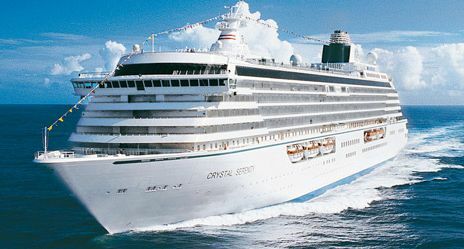 On Wednesday last, The Cruise Examiner boarded Crystal Cruises’ Crystal Serenity at Lisbon for an 11-night cruise to Madeira, the Canary Islands, Morocco and Spain. Here is his first report on the new all-inclusive Crystal Cruises. Meanwhile, Azamara Club Cruises has become the latest to join the all-inclusive cruise lines, leaving Oceania Cruises as the odd man out. Elsewhere, the Ocean Liner Society has chosen Plantours’ MS Hamburg for its 2013 annual group cruise.